Work with talent on the go with this Professional 17" High-Bright Teleprompter Travel Kit from ikan. This kit includes a bright, 1000 cd/m², 17" LED monitor, 70/30 beamsplitter glass, a wheeled carry case, and all the hardware you need to mount it. The kit comes with the base, monitor, collapsible hood, glass, AC adapter, two counterweights, two D-rings with 1/4"-20 screws, and three different risers to fit your camera size. 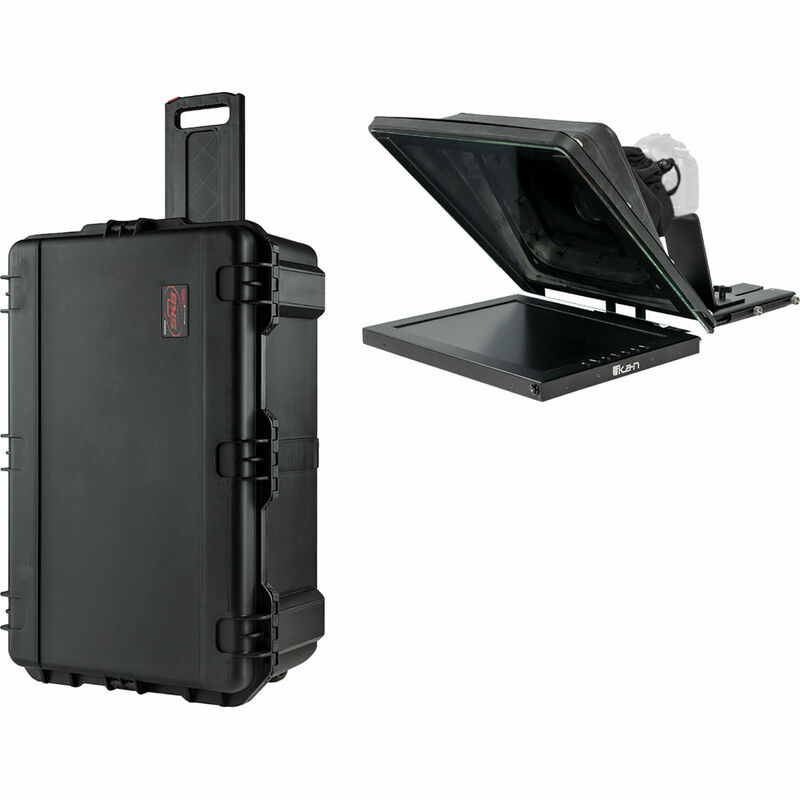 It also comes with PrompterPro software and an SKB iSeries 2217-12 waterproof wheeled utility case for transport. Use the custom-cut foam insert that the teleprompter comes with to insert into the case. See the description below for more information about the individual items in this kit. Make sure your talent can read their lines clearly from up to 20' away with this Professional High Bright Teleprompter from ikan. The durable aluminum teleprompter comes with a 17" LED monitor, 70/30 beamsplitter glass, a collapsible teleprompter hood, and all the mounting hardware you need. The bright, backlit monitor features 1920 x 1080 resolution, 160/170° viewing angle, 1000 cd/m² brightness, and 4:3 aspect ratio, all which provide crisp, clear reading. The monitor has HDMI, BNC composite, and VGA inputs supporting a wide range of source options. The teleprompter comes with a collapsible hood, which includes an adjustable cloth boot to insert your lens. There are multiple 1/4"-20 and 3/8"-16 mounting threads all around the prompter, and it comes with all the hardware needed for assembly and mounting on a tripod or rig. Three risers are included to fit which camera you're using: one for a DSLR or mirrorless camera, one for a larger camcorder, and one to attach a separately available VCT plate for mounting an ENG camera. Counterweights are also included in case the prompter becomes front heavy. The entire kit comes in a custom-cut foam insert which can be repurposed when you want to transport it in a separately available case. An AC adapter and a copy of PrompterPro teleprompter software for Mac and Windows are also included. Protect your gear from dirt, dust, impact, and water with the black iSeries 2217-12 Waterproof Utility Case with Wheels from SKB. This tough case is constructed from ultra high-strength polypropylene copolymer resin. Nice touches like trigger-release latches, holes for optional padlocks, gasket-seal, and built-in purge valve are all standard. Carry the case with the large front and side handles. Travel over flat ground with the retractable extension handle and polyurethane, stainless ball bearing wheels. Box Dimensions (LxWxH) 22.4 x 18.1 x 12.7"
Box Dimensions (LxWxH) 25.3 x 19.8 x 14.7"